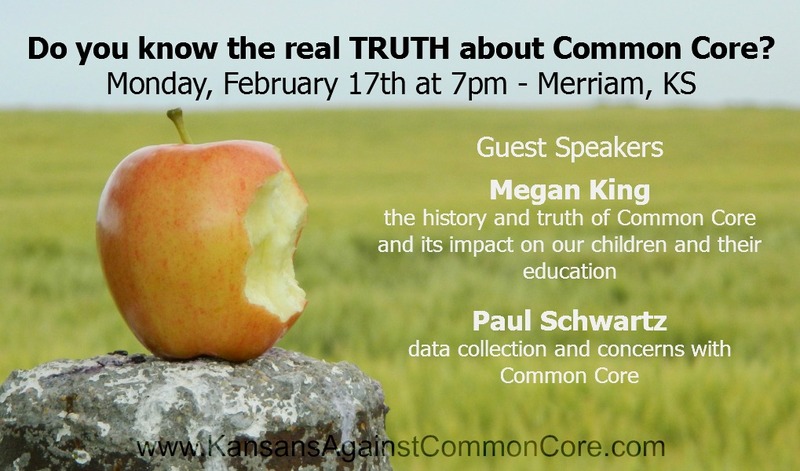 MONDAY – February 17th – Do you know the real TRUTH about Common Core? Don’t miss this great opportunity to learn more about Common Core (Kansas College & Career Ready Standards). *Note from the Library: Besides the library’s parking lot, parking is available behind Taco Bell and to the larger lot west of Taco Bell. Megan is a Preschool Teacher, resides in Lawrence with her husband and three sons. In 2011, while researching a new grading system in her son’s middle school, she stumbled upon the Common Core Initiative. Because of what she found, she hasn’t slept well since and now homeschools two of her children. Megan is a co-founder of Kansans Against Common Core and is working diligently to inform Kansas citizens of the truth about Common Core and the grassroots effort to repeal it. Paul is a Computer Consultant, was a U.S. Air Force Intelligence Analyst for six years and a Subject Matter Expert for IBM, EMC, and now the healthcare industry. He has over 20 years of Corporate IT experience in security and compliance and has consulted for the top companies on the Fortune 500 list with regards to their security and compliance requirements. Paul has worked numerous security incidences as well as led remediation efforts after security compromises. He has also consulted on several states’ Student Privacy bills. He is a concerned husband and father and resides with his family in the Olathe School District.